Hoagie sandwich appeared in Philadelphia during World War II and it was introduced by Italians, who worked at the shipyard known as Hog Island. They were making sandwiches on a long roll, usually Italian or French bread, and making layers of different cold lunch meats, cheeses and vegetables, like lettuce, tomatoes, onions. The sandwich was named Hog Island, that later evolved to hoagie. Hoagie is also known in Europe as ciabatta or baguette and it refers to the type of bread used. 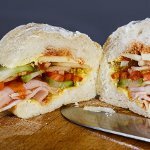 The original hoagie calls for a variety of traditional Italian meats, like salami, capicalla, mortadella and provolone, vegetables, light vinegar and oil dressing. Today most hoagies are single-meat sandwiches, like ham or salami hoagies. You can also find cheese-only hoagie, where the meat is replaced with extra slices of cheese. Did you know that hoagie was declared by Ed Rendell, former Philadelphia mayor, as the “Official Sandwich of Philadelphia”? Celebrate the National Hoagie Day with your favorite hoagie. You can use any kind of meat and cheese to make your own special hoagie of the day.